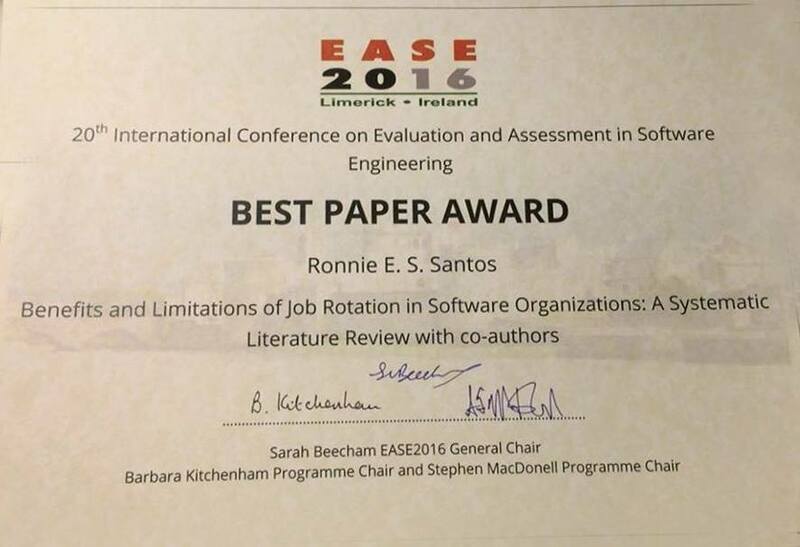 The recent research “Benefits and Limitations of Job Rotation in Software Organizations: A Systematic Literature Review” published in the 20th International Conference on Evaluation and Assessment in Software Engineering (EASE 2016) has received a best paper award in the conference which was venued in Limerick, Ireland. Next week two PhD students of HASE Research Group will participate of the 9th International Symposium on Empirical Software Engineering and Measurement that will be held in Beijing, China. Our group has an accepted paper at the Conference and the presentation will discuss the current state of the replication work of empirical studies performed in software engineering research. These study is an update and an extention of the results produced in a previous mapping study published in 2011. The paper will be presented during the first day of presentations in the session “Community Building & Infrastructure” and a preprint of the work is available to download on the ESEM program. 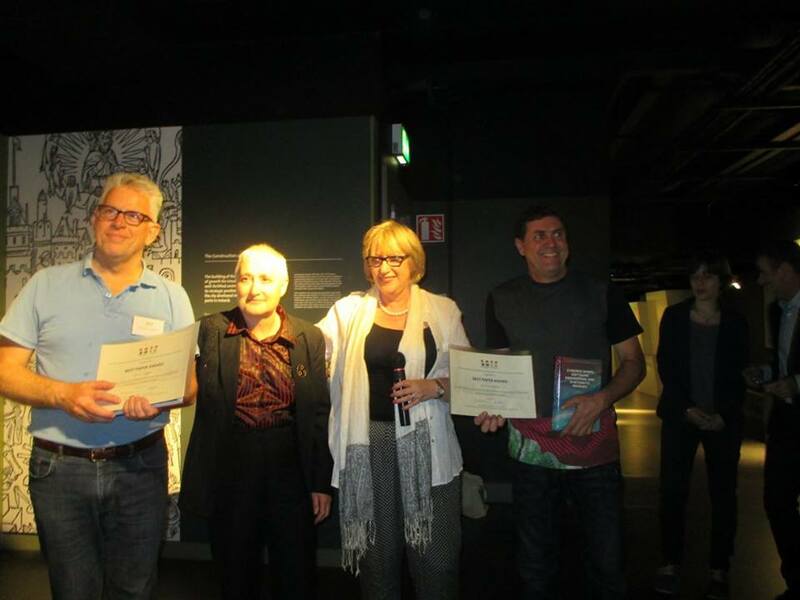 The list of publications was updated with the most recent articles produced by the HASE research group. Check them at haseresearch.com/publications. We updated the list of publications with the most recent journal articles produced by the HASE group. Check them at haseresearch.com/publications. The article “An Empirical Study on the Use of Team Building Criteria in Software Projects”, presented at ESEM2011 in Banff, Canada, received the joint Best Paper Award. The article can be found at 10.1109/ESEM.2011.14 and was co-authored by Fabio Q. B. da Silva, A. César C. França, Tatiana B. Gouveia, Cleviton V. F. Monteiro, Elisa S. F. Cardozo, and Marcos Suassuna. The seminar I delivered at BYU on January 19th, 2012, can be seen at here. I summarize most of the results the HASE group produced over the past 6 years, and try to organize them in a coherent form. Fabio Silva, Toronto, January, 2012. The definition of effectiveness is important because what affects effectiveness (positive and negatively) depends on this definition, as well as the identification of factors that moderate or mediate the effects. Our first studies on antecedents of effectiveness were on motivation (2007…). The “level of effort applied to tasks” is proposed as an antecedent of effectiveness by Hackman (1987) and supported in Yeatts and Hyten’s (1998) model, and this level of effort is driven by motivation. These models hypothesize that the more motivated the individual, more effort he or she applies to the task. Therefore, understanding motivation was an important step to understand effectiveness. Using a set of 20 motivators presented in a systematic literature review developed by Sarah Beecham and colleagues (Beecham 2008), we conducted a survey with software engineers from industry to identify the influence of each motivator on individual motivation. We grouped the motivators using principal component analysis and arrived at results that fit quite well on Hackman’s model (Hackman, 1987). We used these results to support the proposition of guidelines to develop motivational programs. In 2009, we started a study about antecedents of success in Agile development. We focused that study on SCRUM projects. Our goal was to correlate the use of agile practices, as proposed as success factors by Chow and Cao, and the success of projects that used SCRUM. Our results (reported here and summarized here), showed that, in the particular context studied, only a subset of the success factors proposed by Chow and Chow correlated to project success. We also investigated another type of antecedents that are related to team composition. In 2008, we started a mix method studie involving qualitative and quantitative research, to identify the criteria used by project managers to select members for software teams. We also correlated the level of use (formal, informal, not used) of these criteria with project success (a type of team effectiveness). The results, published last year at ESEM’2011, showed that the use of the criteria correlates with project success. That is, teams that were built using the set of criteria in a rigorous way were those that achieved more success.
. how is motivation related to effectiveness? in other words, how is motivation related to all facets of effectiveness, including productivity, team member satisfaction, team continuity, etc.?
. what are the contextual factors that made only a few success factors correlate to project success in our SCRUM study? Are Chow and Cao wrong? We don’t think so. What is more likely is that (1) the success factors depend on contextual factors (moderators and mediators) that were not properly addressed because we did not know about them (2OI) and/or (2) the success factors affect different aspects of effectiveness that were not measured because we used a very simple (maybe oversimple) operationalization of success.
. it seems clear (from our results and also from various other studies in group theory) that team composition affects effectiveness. What is less clear is how team composition affects effectiveness and how task type and development process moderates this effect. I plan to show the results of the research described above and then elaborate more on the questions that we are investigating with respect to antecedents of effectiveness. At this point in the seminar, I hope to start to show the model we are consolidating (from other researchers) and testing (with our empirical studies). Beecham, S., et al., 2008. Motivation in software engineering: a systematic literature review. Information and software Technology, vol. 50. Elsevier, pp. 860– 878. T. Chow; D. Cao, (2007) A Survey Study of Critical Success Factors in Agile Software Projects. The Journal of Systems and Software, n. 81, pp. 961–971. Hackman J (1987) The design of work teams. Handbook of organizational behavior 315-342. Yeatts DE, Hyten C (1998) High-performing self-managed work teams. Sage Publications, Inc.